Can you hear that; that's the sound of the Sonic Boom! Click here to play! Join in the aerial mayhem as you take to the skies and try to win yourself some incredible cash payouts! It's not a bird, it's not a plane, it's a Sonic Boom! 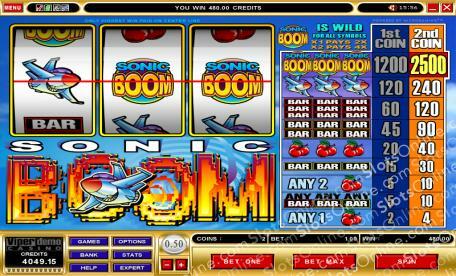 Sonic Boom is a wonderful 3-reel slot played across a single pay line. There are plenty of great symbols that can help you win big payouts, with cherries, bars, and planes the best of the lot. However, if you are in the mood for big winnings, look out for the Wild Sonic Boom symbol. The Wild can be substituted for any other symbol on the reels, and when used in a winning combination it will automatically double the initial payout; land two in a combo and you'll get quadruple! If you manage all three Sonic Booms across the single pay line you will find yourself with up to 2500 times your original stake! The open skies are waiting for you; start playing Sonic Boom today. The Sonic Boom symbol is Wild and can be subbed into winning combinations by action as any other symbol on the reels. One in a combo doubles the payout, and two quadruples it.